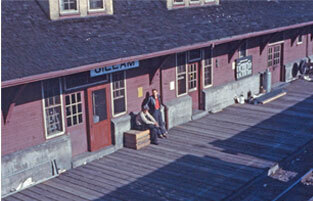 The Gillam Train Station is a federally designated heritage site and a landmark building in the northern Manitoba town of Gillam. It is currently in disrepair, although it remains in use for passengers of Via Rail. Study and consultation to adaptively reuse the train station were conducted in 2010. BridgmanCollaborative study proposed the following design strategies. Restoration of the exterior was to accord with the Station’s original appearance in 1923, including rebuilding the historic boardwalk. Interior areas were to be reconfigured to house Town of Gillam offices and the KUNO WAY ECHI KAYWIN (Keepsake) Museum. The Museum was to house a collection of community stories and oral histories, photos, and artifacts from the Town of Gillam, Fox Lake Cree Nation, Manitoba Hydro and Via Rail. The Via Rail ticket office was to remain in the station. Kitchen facilities would make community events another flexible option in the adapted space. The ceiling of the first floor in the museum would be opened to a double height space to create a bright and welcoming venue. BridgmanCollaborative's report was completed in 2011.